Project: Oculus, is the first of a series of thematic treatises examining selected projects and research to engage and reveal alternative narratives and ecologies. Developed with Gallery Paule Anglim (now Anglim Gilbert Gallery), San Francisco ,CA and FractalTerror Press. 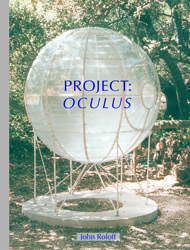 Project Oculus was published (belatedly in 2009) by Gallery Paule Anglim, FractalTerror Press and the artist upon the occasion of the installation of Oculus: Emerson/Beebe (Sonomia), 2000, at the di Rosa Preserve in Napa, CA. 125 pages. Project: Oculus is available in limited form as a portfolio edition from the artist. A formal publication is under design/revision. Project: Metafossil, is the second of a series of thematic treatises examining selected projects and research to engage and reveal alternative narratives and ecologies. Developed with Gallery Paule Anglim (now Anglim Gilbert Gallery), San Francisco ,CA and FractalTerror Press. 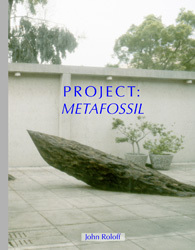 Project: Metafossil, utilizes the work Metafossil (Pinus: radiatia, ponderosa, balfouriana), 1992, as a lens for examing themes of the ship, organic systems, paleogeographies/migrations land/sea :: sea/ land and related themes. Project: Metafossil is available in limited form as a portfolio edition from the artist. A formal publication is under design/revision. 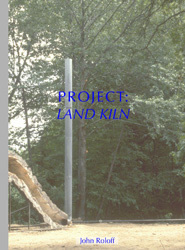 Project: Land Kiln, is the third of a series of thematic treatises examining selected projects and research to engage and reveal alternative narratives and ecologies. Developed with Gallery Paule Anglim (now Anglim Gilbert Gallery), San Francisco ,CA and FractalTerror Press. Project: Land Kiln, examines the series of site-fired kiln/furnace projects from 1979 to 1992 and other works influenced by or extrapolations/conceptual extensions of the kiln pieces/process. Project: Land Kiln is currently in the design phase. 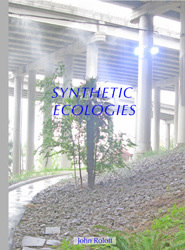 Synthetic Ecologies, is the fourth of a series of thematic treatises examining selected projects and research to engage and reveal alternative narratives and ecologies. Developed with Gallery Paule Anglim (now Anglim Gilbert Gallery), San Francisco ,CA and FractalTerror Press. Synthetic Ecologies examines themes of: systemic practice, proto-works, meta-ecologies/narratives, research-driven, para-architectures/ works, symbiotic-structures/works, sea within the sea and related themes. Synthetic Ecologies is currently in the design phase. The Sea Within the Land/Laramide, is a special edition documenting a project of the same name. Developed with Gallery Paule Anglim (now Anglim Gilbert Gallery), San Francisco ,CA and FractalTerror Press.. The Sea Within the Land/Laramide is a manual for a project done for the Denver Art Museum in 2011 for the exhibition Overturned: Ceramics Without Limit. The document describes the concepts, research and construction of the project so that it may be re-constructed by the museum as part of their permanent collection. 96 pages. 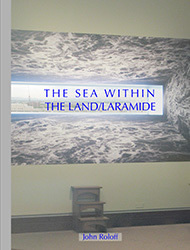 The Sea Within the Land/Laramide is available in limited form as a portfolio edition from the artist. A formal publication is under design/revision. Sentient Terrains, is a slide by slide documentation of the lecture: Sentient Terrains (Selected Projects) / Graduate Lecture Series / San Francisco Art Institute / San Francisco, CA / November 2, 2012. Updated work and selected essays have been added to the lecture images. Developed with Gallery Paule Anglim (now Anglim Gilbert Gallery), San Francisco ,CA and FractalTerror Press. 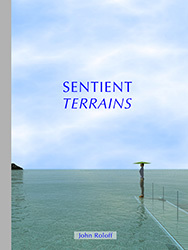 Sentient Terrains is available in limited form as a portfolio edition from the artist. A formal publication is under design/revision. 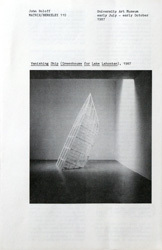 John Roloff: MATRIX / Berkeley 110, was published in honor of the installation of Vanishing Ship (Greenhouse for Lake Lahontan), commissioned for the MATRIX program at the Berkeley Art Museum, University of California, Berkeley, curated by Connie Lewallan in 1987. The publication in singular form is probably not available but is included in several compilations such as: MATRIX Berkeley 1978-1998, published by BAM UCB in 1998. 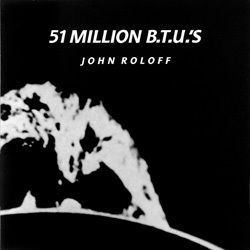 51 MILLION BTU'S, was published to celebrate the group of kiln/furnace works, Untitled (Earth Orchid), 1988, Oculus: Dead Sea/Oil Field, 1989, and Humboldt Ship, 1989, collectively known as 51 Million BTU's. This publication is archived in the Smithsonian Institution and numerous University and private libraries. It is available in limited supply from Anglim Gilbert Gallery, San Francisco, CA and the artist. A special edition of 51 copies was organized for Shadowshop, a project by the artist, Stephanie Syjuco at SFMOMA opening November 2010. 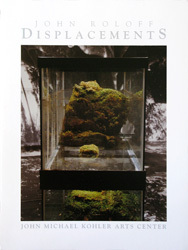 The Rising Sea: Images and Constructions from South Florida and Other Selected Works, was published to celebrate this solo retrospective-like exhibition, curated by Jim Peele for the Museum of Contemporary Art, Lake Worth, FL in 1998. Essay by Robert C. Morgan. Devonian Shale: Aquifer I, was published in 2000 as a limited edition of 4 specially bound books by FractalTerror Press. 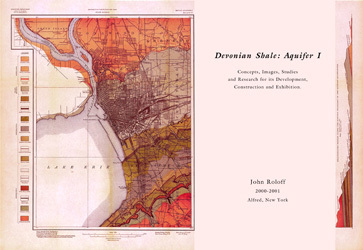 The publication describes the research, fabrication and concepts related to Devonian Shale: Aquifer I.
John Roloff: Displacements, was published in 2000 by the John Michael Kohler Art Center in honor of an exhibition of the same name, curated by Lisa Tamaris Becker who also contributed the publication's essay. This publication is archived in the Smithsonian Institution and numerous University and private libraries. It is available in limited supply from Anglim Gilbert Gallery, San Francisco, CA, the artist and most probably from the JM Kohler Art Center, Sheboygan WI. San Francisco Wharf Complex, is a special edition documenting work and research done through a series of grants and fellowship at the Exploratorium, San Francisco. San Francisco Wharf Complex, considers the geologic and industrial history of the wharf complex in San Francisco as a landscape made of previous landscapes. 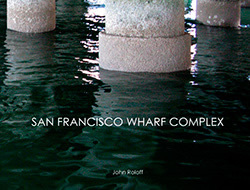 San Francisco Wharf Complex is available in limited form as a portfolio edition from the artist. A formal publication is under design/revision. Rapson Group / Site Index, is a documentation of the concepts, project evolution, site research, design and installation of the projects: Rapson Group and Site Index completed at the College of Design, University of Minnesota, Minneapolis, MN by John Roloff and Rebecca Krinke between 2001 and 2013. 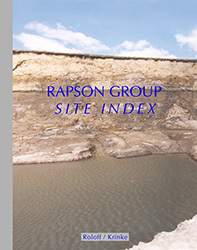 Developed with Gallery Paule Anglim (now Anglim Gilbert Gallery), San Francisco ,CA and FractalTerror Press..
Rapson Group is currently in the design phase. It will be produced in a limited form as both a portfolio and formal version. A formal version is intended for the College of Design library at UMN.